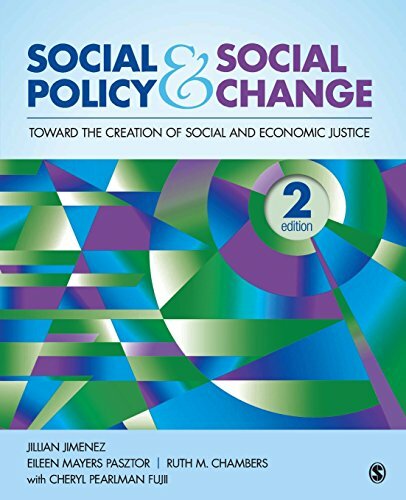 Amazon.com description: Product Description: The Second Edition of Social Policy and Social Change is a timely examination of the field, unique in its inclusion of both a historical analysis of problems and policy and an exploration of how capitalism and the market economy have contributed to them. The New Edition of this seminal text examines issues of discrimination, health care, housing, income, and child welfare and considers the policies that strive to improve them. With a focus on how domestic social policies can be transformed to promote social justice for all groups, Jimenez et al. consider the impact of globalization in the United States while addressing developing concerns now emerging in the global village. About: The Second Edition of Social Policy and Social Change is a timely examination of the field, unique in its inclusion of both a historical analysis of problems and policy and an exploration of how capitalism and the market economy have contributed to them.